New York Met's starting pitcher R.A. Dickey has had a career year so far in 2012 and leads the NL roster of pitchers in wins at 12 with a solid 2.40 ERA and 123 strike outs. However, National League manager Tony La Russa and staff decided to start San Francisco Giant Matt Cain instead (7-1, 2.87, 70 SO) to reward him for a "career of excellence". La Russa said it was a "tough call." Dickey will enter the game in relief and La Russa has decided that when the knuckleball pitcher enters the game so will Phillies catcher Carlos Ruiz. Ruiz has never caught for a knuckleballer in his MLB career. The two are expected to take some time to work on the connection in the bullpen before Tuesday's game. Ruiz has had a breakout season at the plate to propel him to hi first All Star appearance, but it's his excellent defense behind the plate that has defined his career. 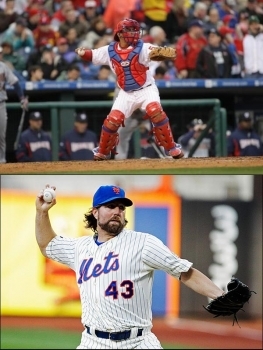 The Ruiz-Dickey duo can be expected sometime in the 5th or 6th inning. The National League squad is down to just two catchers. Yadier Molina had to return to Puerto Rico to tend to family matters. Buster Posey will start and Ruiz will be the relief. A provision in All-Star play would allow Posey to return to the game if Ruiz was injured. Other Phillies on the roster include LHP Cole Hamels and RHP Jonathan Papelbon. They may also be used throughout the night. Hamels earlier on and Papelbon in a closer or setup role. The 2012 All Star Game from Kansas City, MO is at 7:30 pm on Tuesday on FOX.